Yesterday, in a private ceremony in his office, Indiana Gov. Mike Pence signed into law the state's "religious freedom" bill, which would allow businesses to refuse service to LGBT customers. Numerous local companies and institutions have wasted no time in condemning the law, and that includes the NCAA. The NCAA's offices are in Indianapolis, which will host next week's Final Four and next year's Women's Final Four, so this is something that could legitimately affect its operations. 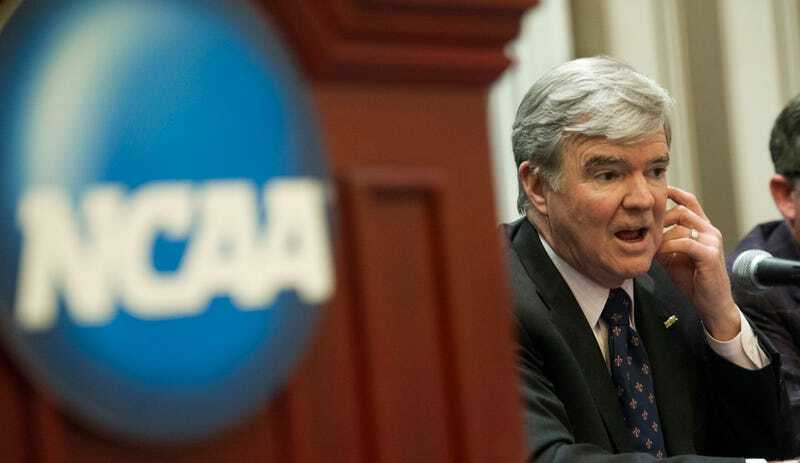 But more than that, the NCAA has a history of backing progressive causes. Last year it spoke out publicly against a proposed state amendment banning gay marriage; in 2005 it unilaterally issued playoff bans to certain teams unless they dropped their American-Indian mascots; in 2001 it banned Mississippi and South Carolina from hosting (most) postseason events because those states' capitols still fly the Confederate flag. The NFL is strongly tied to Indiana as well. Aside from just having a franchise that does business there, the combine takes place at Lucas Oil Stadium every year. But the NFL, which spoke out last year against a similar "religious freedom" bill in Arizona, and even considered moving the Super Bowl, has been completely and mysteriously silent, even in response to requests for comment from multiple outlets (including this one). Maybe it's coming today—maybe the statement is being crafted as we speak. But for a league that considers itself a moral arbiter on everything, that's now facing some real-world discrimination, and that has the rare audience that spans all ideological spectrums, it'd be nice to hear something soon. Update, 2:00 p.m.: "We do not have a comment at this time," NFL spokesman Greg Aiello told the Indianapolis Star. "We are in the process of studying the law and its implications." There are 18 Armors in the Official Iron Man 3 Game. Can You Name Them?